Have you ever bought bottled water before? I can still remember the very first time I saw bottled water on the store shelves right along side the soda for the same price. I thought what a rip off and a scam. Who in their right mind would pay the same price for bottled water that you can get just about anywhere for free? It's obviously a whole lot cheaper to produce then a bottle of soda and selling at the same price. Boy was I wrong! The bottled water industry has flourished into a multi billion dollar industry with new competition continuing to enter this lucrative and profitable market. It's been great for the Coke's and Pepsi companies selling pure water at ridiculous markups, but not so good for the millions of plastic bottles that now clutter our landfills. If there was someway to make a Gobie H2O Water Bottle that has a built-in filter, you could save hundreds of dollars by essentially making your own pure water and greatly cutting down on single use plastic bottles. With the built-in filter capable of making over 100 gallons of drinking water, this is also a fantastic Alternative to Water Purification Tablets during an Outdoor Survival Emergency. For something that seems so simple as a water bottle, the GOBIE Water Bottle invented by Rusty Allen has really thought of everything and is truly the Hi Tech Water Bottle of the future. 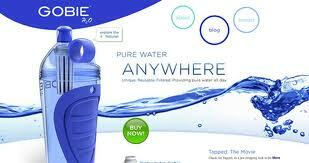 The best way to understand all the features that are built into the GOBIE Water Bottle is to watch the video below. They seemed to of thought of everything including the patented hard plastic bottle that you can squeeze just like the inferior plastic bottles with fancy labels. The built-in filter is an organic solid carbon block made out of coconut shells that's good for over 100 gallons of pure clean water before needing to be changed. The squeezable rubber grip is made of medical grade thermoplastic elastometer that will not degrade over time. This high tech water bottle is made to last a lifetime and a must have for hiking and backpacking in the wilderness. It's easy to see that the GOBIE Water Bottle is going to be a big hit with consumers that spend money on bottled water on a regular basis. At the cost of regular bottled water these days the GOBIE will pay for itself in no time. As far as marketing it to the outdoor enthusiast's from biking to hiking and even adding this to your survival kit, the potential is HUGE. They retail for $29.99 and each filter is good for about 100 gallons of pure drinking water making it an economical purchase that will more then pay for itself in no time. 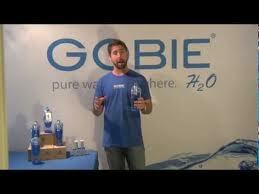 Everything about the GOBIE H20 has success written all over it and I'm sure the Sharks will agree. But until we hear the numbers and how much it cost to produce a GOBIE Water Bottle, it would be difficult to see if this is a good investment or not. If I had to guess I would say that Rusty is not willing to give up a large percentage of the company for any amount of money at this stage of the game. The Sharks are going to battle it out with this one and most likely get a few hooked on the GOBIE H20 Invention. Is your product BPA free??? Not one shark asked that and I was shocked! the sharks were pretty dumb in that area, didnt ask the right questions, I was shocked too! Here is the BIGGEST issue... He threw in some dirt and filtered the water, drank it. There will be people who will try this in a "survival" scenario and get sick. No form of carbon filter removes bacteria. In fact under quite normal operating condition all carbon forms can and do become perfect breeding grounds for bacteria, including pathogenic bacteria. You are right about the carbon filter not removing bacteria... UNTIL NOW because a new company is coming on the scene with water bottles, faucet fittings, and whole home/office filters that KILLS ANY pathogen -germs, bacteria, viruses, even anthrax! You will hear about it real soon (before Christmas). The company uses activated ceramic media that destroys pathogens molecularly! It will hit the market before the first of the year and it will be BIG! carbon removes organics in water. there are certain kinds of catalytic carbon that are more effective. I am shocked Daymond agreed to pursue this business. This product does not have NSF approval...designed to meet it, but has not been tested to NSF standards. In Gobie H2O FAQ website, it notes this bottle only filters contaminants present in municipal water sources only. All filter water bottles do this. How does it remove 99.9% contaminants, yet it doesn't remove Giardia. There is currenly a much better filter water bottle in the market that really removes 99.9% contaminants and it removes Giardia. It's Clear2Go...selling on clear2o.com for less than the selling price than this bottle. Clear2go only filters chlorine out of the water. It is a basic carbon filter. Does it filter fluoride out of the water? What the hell was Rusty on? I know it's nerve wracking in the tank, but he really seemed like his mind was all over the place. I'm surprised Daymond stayed in even after Rusty's bizarre and obnoxious comments. To the person that asked ", it notes this bottle only filters contaminants present in municipal water sources only. All filter water bottles do this. How does it remove 99.9% contaminants, yet it doesn't remove Giardia. ", he mentions that the filter which filters more contaminants than others is only in testing phase. It may help you to watch the episode again though I understand how some people may not be able to follow along with his poor presentation. Expensive, but a neat design. Could be used with a more effective filter. On the company website it states that it is intended to filter water from only a municipal source and they are working on filters for other water supplies. At this time it only filters tap water. Yeah, a bit expensive but sounds OK for use. Btw, I'm looking for something like a carbon water filter. Anyone heard about this? I am Excited about the water bottle but concerned that the company is charging the credit cards prior to shipment which is 6 to 8 weeks. Are the sharks funding the water bottles or are the customers????? It is not good company policy to charge your credit card prior to shipment. Although I'm very excited about getting the new water bottle I am concerned about the practices. Don't the sharks given enough money where the customers do not have to supply the money for manufacturing??? Did see the re-runs last night. FYI: most of you are wrong if you think the Sharks should asked the question what filters out and what not. This is strickly business ! The important questions are: Is there a market for it ? What does it sell for ? What does it cost to make and market ? ...and what do you asking from the investors ? If your questions were important, there would not be any Smoke or Liquor Stores. Funny how most of us are anons. To person above me: they should also have asked just to verify if it's a good, reliable product that is in some way unique or better to the consumer. do u know the dimensions? Hey,Amazing product.GOBIE H2O’s bottles utilize an active carbon filter to uproot the upsetting chlorine taste and smell from your nearby tap water source.GOBIE H2O filtered water bottles are not designed to be utilized with untreated water sources,for example, lakes and streams.The initiated carbon filters in the GOBIE H2O’s filtered water bottles are designed to be utilized for 3 months or up to 100 gallons of water filtered and designed to meet NSF-Standard 42.Replaceable filters will prove to be useful for people who like to keep their GOBIE H2O new.The GOBIE H2O filtered water bottles are of course BPA free. The guy froze but EVERYONE missed the key technological advantage of this product. These Sharks proved they are really just airheads. The owner of the company said more than once that his product filters MORE contaminants than any other bottle filter in the world at 99.99% where the competition only filters 99.9%. In water filtration that extra .09% is huge. The sharks were totally idiotic on this, missed the whole point and advantage. They all just looked at the colors and the shape of the bottle and missed the technological advantage which is "the squeeze plus the better 99.99% filter filter more water than anyone else in the world", others can't meet the same filtration level because they lack the water pressure created by squeezing the bottle to penetrate a 99.99% filter and so the competition uses inferior filters because they lack the water pressure. Geeze! What f'n idiots the sharks were on this. I hope they read this and slap themselves. I'm not sure even the business owner knows this. Someone please contact him and explains this to him. If the company needs a technical advisor to outline their competitive advantages of their product then they can email me at webdevelopmentusa@yahoo.com. Activated Charcoal filters have been around for 20 years and this is not new technology. Innova Pure Water, Clearwater Fl. Patented this technology. It also has patents for filter connections via to the Top, and also through a Straw to a filter. This guy is a hoax! This is Old Technology! Just the Bottle is new! Seychelles makes a better product for filtration, radiological, pathogenic, etc. Bottle's not as pretty, but it's a better survival tool. Who's dumb enough to drink tap wAter these days! ?